The James Burn Lhermite EPX700 is a manually fed punching machine designed for intensive commercial use. This heavy duty console punch caters to a wide variety of materials of almost any shape and size including paper, covers, card, backboards, plastic, acetates, snap-out sets, etc. The EPX700 offers the flexibility of operation, high performance, and a very short make-ready time, which makes this machine ideal for busy finishing departments. The strength and high quality of the punching tool ensures long term reliability and the compact dimensions of the EPX700 allow easy installation in busy work locations. The EPX700 is foot pedal controlled which keeps your hands free when processing paper and other materials. 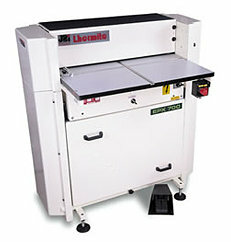 The EXP700 also offers a heavy duty floor punch capability of punching up to a maximum binding edge of up to 26 inches. A major advantage of the EPX700 us the interchangeability of its tools with the Lhermite EP range and larger Automatic Punching Machines. A range of inexpensive adaptor kits permits cheaper upgrading and reduced tooling costs for larger installations which is another great feature. The EPX700 is a freestanding machine with a generous working area and tool changes are simple and take approximately 5 minutes. This machine is highly recommended for high-output environments like binderies, and print shops. Since this machine has the ability to process paper as well as other materials, you will have the ability to punch just about anything! If you have any questions or are interested in purchasing the James Burn Lhermite EPX700, visit us at SpiralBinding.com. We have great pricing on a full line of Punching Machines. Call us at 1-800-631-3572 for more information!